for evaluation of your needs. Armed with knowledge of the department and the real estate market, your buyer agent will provide choices that correspond with your demands and are in keeping with the local characteristics. Nantes is a city bordered by the Loire with the Erdre flowing through it. Water is an important element in its history. Comprised of 11 districts In constant evolution, Nantes offers countless possibilities for accommodation in surroundings full of history yet decidedly looking to the future. Beginning in the last decade, the city has welcomed between 8 000 and 12 000 new arrivals each year. You'll be love the Centre of town. You can stroll through the Quartier du Bouffay, still reminiscent of medieval times, visit the newly renovated Chateau de Ducs de Bretagne, and the Cathedral St-Pierre and St-Paul, The Island of Feydeau no longer an island (due to the refilling of a waterway in the Loire), the Quartier Graslin linked by the Passage Pommeraye to the Quartier de la Bourse and countless cultural wonders to discover. You'll be surprised by the scope of construction in the new centre of the Ile de Nantes. From now until the year 2010, office and residential buildings are being erected in the heart of the green belt on 350 hectares. Just finished and in use is the new Palais de Justice designed by Jean Nouvel. You'll appreciate the residential areas such as Sainte-Donatien, Zola, the Place Mellinet and the Place Canciaux for their tranquillity. You'll love the Marché Talensac, institution and THE place for meeting people. 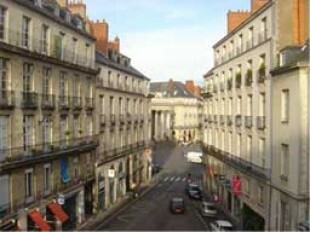 Students tend to live in the areas close to the universities such as Haut Pavés ; Saint-Félix, and the centre with easy access to the tramway. You can find magnificent countryside along the verdant banks of the L'Erdre during a riverside stroll or bike ride. Nantes is made up of green spaces including the Jardin de Plantes, the Parc de Procé, the Grand Blotereau; the Ile de Versailles. In the Nantais countryside, villages such as Nort-sur-Erdre, Sautron, Bouaye, Le Pellerin and St-Etienne-de-Montluc..
To the south, all along the route you'll see the wineries where you can taste, with moderation, of course, the different vintages of the famed Muscadet, a wine that goes well with seafood. A coastline filled with seaside resorts such as La Baule (the most beautiful beach in Europe with nine kilometres of sandy beaches and buildings with magnificent ocean views) with its casino surrounded by Pouliguen and Pornichet, Piriac/Mer, La Turballe, Le Croisic, Batz- Surmer. On the Loire river, the industrial St-Nazaire and its well known naval yard. The Presqu'ile Guérandaise will lure you with its medieval city and its salt marshes, on one side, the peat moss at la Brière, on the other, shops and cobblestone streets. In Pornic, you'll appreciate the large seaside family villas. These chalets were built in the 1850s. One of the most captivating places in Pornic, is the chalet Calypso, nested in a park. Two centuries of seafaring successes that won over the likes of Michelet, Georges Sand, Jules Verne, Renoir. The beaches of St-Brevin-les-pins and St-Gildas light the southern entrance to the Loire River up to the St-Nazare bridge, are wonderful for promenades and discovery. So many styles are brought together in the Loire-Atlanique.If you search through a « folie Nantais », you'll find houses from the 1930s, buildings from the 60s, country houses, town houses, longères and farms - for renovation or completely renovated. The Loire-Atlantique knows how to welcome you and help ensure you a pleasant style of life.